(Photo by John Valenzuela). 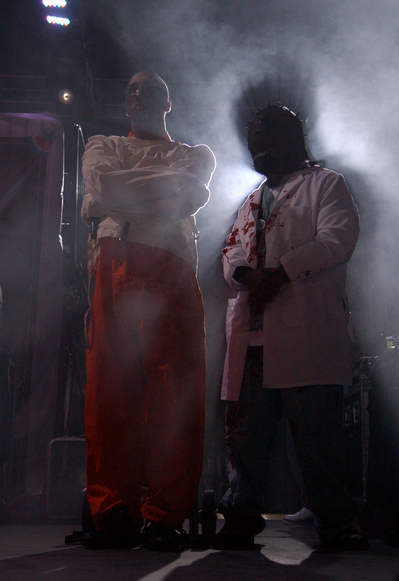 To the left is Joe Budden, in the straight jacket, and to the right is Royce da 5’9″ with the crazy mask on. This was before Slaughterhouse performed at the Paid Dues Festival. Besides Budden and Royce, Joell Ortiz and Crooked I are also a part of the hip-hop supergroup Slaughterhouse. Each member was able to perform separate songs outside of their group material, their first song together was “Slaughterhouse,” but outside of the dramatic opening you see in the photo, the set sort of dragged and could have been rehearsed better. Budden, who I personally like along with Crooked I, Royce and Ortiz, seemed to sadly overshadow the other members with what seemed like an extra long performance of “Pump It Up” and his ramblings about “I smoke too much” or what hip-hop means to him. On top of this, the guy next to me in the crowd wanted more Crooked I and constantly shouted out “Long Beach,” “Crooked I” or “hip-hop weekly” when Budden, Ortiz or Royce performed. The Crooked I chants were in reference to the Long Beach artist performing new freestyles over famous hip-hop instrumentals every week on the Internet for a year from 2007 to 2008. This entry was posted in Uncategorized and tagged Slaughterhouse at Paid Dues Festival 2009 by Wes Woods. Bookmark the permalink.